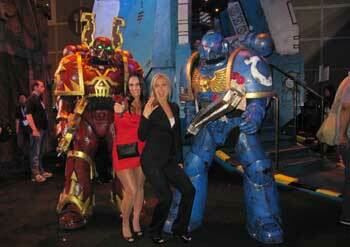 Last week, Titan and I went to Los Angeles to attend E3, the Electronic Entertainment Expo. 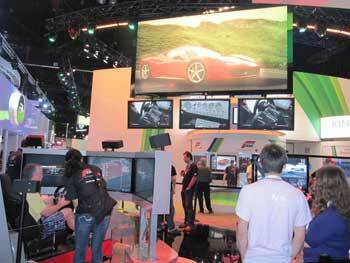 It is the most famous gaming expo of the year where the biggest game companies in the world announce their new consoles and games. Those of you following me on Twitter got the inside scoop on some of our wacky adventures... but as promised -- you get the full story here. Some AE staff do not have game-names... but do like Warhammer! Earlier that day I was truly flattered when we walked by the Sony area and the President of Sony Online Entertainment recognized me! This was a pretty big deal to me personally because John Smedly (known online as Smed) has been a long time role model of mine. He created the original EverQuest. He is also one super nice guy who really loves games. You would be surprised at how few Presidents of major game companies actually play their games. We also got to hang out with some big-wigs from Ubisoft (I totally scored Zhoom a pre-release copy of the upcoming Assasin's Creed) and... ok. You guys know me. I am literally on cloud 9 after this trip and am so excited I do not know how to contain all the joy. (And if you think I am happy, you should see Titan!) . It got better though. 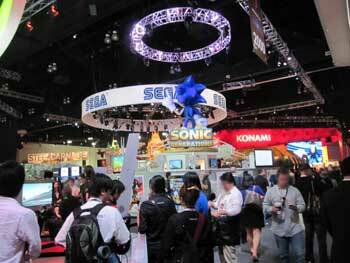 We made friends with head honcho over at BigPoint and got invited to the most exclusive party at E3. Where, I am embarrased to say.. I was standing 3 feet away from Notch and missed the chance to meet him in person! (In all fairness, I did not know he was Notch. I only figured it out when I was telling stories to Rolith and it hit me who he was.) We cancelled our flights to attend, and PariahCon was the next day. So with less than 1 hour of sleep we got on the 1st flight back to Florida to try to make it to PariahCon before the panel started! PariahCon is a brand new convention created by a friend of Korin's. While small, it was super fun for everyone who attended. Nythera, Thyton, Faith, Safiria, Jemini, Stratos and other AE team members were running our booth and showing people how to play the AQworlds card game. Cysero really does look like his NPC! After battling all this undead we are getting a breath of fresh air and returning to the SkyGuard storyline! Then, the following week we will return to DoomWood and enter... THE NECROPOLIS! Do YOU have what it takes to get to the top? It’s your wits versus the Tower in 10 levels of perilous puzzles and losing is the pits, literally! (Rumor has it that all failing challengers end up as new Tower minions or in… the INFERNAL PIT OF ENDLESS DOOM!) But you shouldn’t worry about that. You’re a hero with brawn AND brains, so making it to the top will be dead-easy. Right? You’ll need to pull levers, navigate traps, and open doors. Sounds simple, but thanks to Cysero thinking outside the box and inside the coffin, you’ve got a real challenge to overcome! Thankfully, you’ll also have a kind, compassionate voice spurring you on to success as you ascend the levels. We consider the voice-acting (done by Kimberly of One-Eyed Doll), a triumph. Make a note of her huge success. When- or should I say IF- you get to the top, you’ll meet the Master of the Necropolis. This twisted teacher will have a bonus cutscene, a shop full of ebilly-skullicious necro-gear, and the merge shop to make the Necromancer class! The Tower: Purchase the NUE Necronomicon from the Rep Shop in Lightguard (requires rank 10 DoomWood Rep); find the Creature Shard (drops off the Creature Creation in the Maul); and talk to the Master at the top of the Tower to buy it for 50,000 gold. The Hideout: Purchase the Necromancer Class for 2,000 ACs by talking to Zorbak. Other than the price (and the fact that you can store the AC version for free because it is an AC item) there is NO DIFFERENCE AT ALL between these two versions of the class. They have the same appearance, they have the same skills. But Alina, you ask, what if I don’t WANT to become a Necromancer? I still need to get into Necro U to save DoomWood. What do I do? While Artix and Cysero are having a blast at the Con, Samba, Yorumi, Zhoom, and I have been having an equally explosive time here at the Lab. (Bugs do not respond well to TnT. Neither do laptops, unfortunately.) I’ve got a checked list as long as my forearm, and it’s all cleared off, which means it’s time for YOU guys to get your game on! The Necromancer Class comes out TOMORROW. Somehow people are still confused about the EARNED & AC versions of the class so I will try and break it down. There will be 2 paths to get that lead to obtaining the non-member Necromancer class. PATH 1, The Earned Path: You can EARN the Necromancer through hard work and dedication. 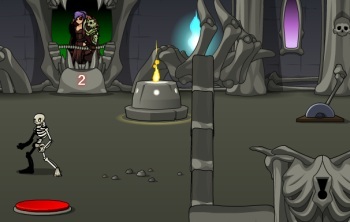 Once you reach the top of the Tower of Necromancy in DoomWood the master of the tower will offer you the class if you are able to deliver 2 items. The first is the Necropolis University Expanded edition of the Necromonicon which can ONLY be found for Rank 10 DOOMWOOD REPUTATION from the DoomWood Rep Shop in LightGuard Keep. The second item a Creature Shard that will be a 5% drop from the Creature Creation in the Chopping Maul. In summary, to earn the EARNED version you need to get to Doomwood Rep Rank 10, Farm the Creature Creation and overcome all of the tests and puzzles on your way to the top of the tower. PATH 2, The AC Path: You can BUY the Necromancer for 2000 ACs from Zorbak in his hut in the Chopping Maul map. You will have to have completed all of the doomwood quests neccessary to enter Zorbak's hut but hopefully you have aleady done that. the AC version will also be able to be purchased through Quibble until he leaves town, then you will have to buy it from Zorbak if you want that version. It will NOT be going Rare when Quibble leaves. Now let me tell you what to expect from Necromancer. You need to understand the Necromancer to really master it. Necromancers are all about stealing life energy from the living and even sacrificing their own life energy to become more powerful. If you are unwise, you can eaisly kill yourself with this class. The class balances on the razor's edge between life and death. Using your own life force to power your pet and stealing your enemies life force to keep you alive. It needs you to pay attention and use your brain. Watch your HP bar, find the happy place between sacrifice and power... then DESTROY! Summon an undead minion to your side or sends it into a frenzy, doubleing all damage at the cost of health. This is a very necessary skill to understand. FIRST, if you do not summon your minion, your attacks will do next to nothing to your foe.This should the first skill you use, unless the Skeletal Minion is already standing right in front of you. SECOND, if you have another pet equipped, UNequip it. Your minion cannot be summoned if you already have a pet equipped. THIRD, once your minion has been summoned this becomes a POWERFUL attack buff for your pet. You watch as your pet goes into overdrive doing slightly more than DOUBLE DAMAGE for the duration of the effect, but you also watch a portion of your life energy tick away. Weakens the target, lowering damage while stealing some of its life and healing you. You will be using this skill a LOT. Not only does it do a small amount of damage and return some HP to you, it also lowers your foe's damage output by 40% for the duration of the effect. As nice as this is, between your pet's Frenzy skill and the Infect skill, you will be giving up a lot of your life. Use this to keep you going. Infect yourself, damaginf yourself tor estore MP. THIS SKILL is the dangerous one. You can get away without using it, but if you learn how to use it wisely, it basicaly opens up a world of infinite power to you. Use this skill to convert a good portion of your HP directly into MP. Master this skill and you master the class. Pretty standard fare here. Ranking up the class unlocks the ability to do more damage and do it faster than ever before. Order your pet to attack doing increased damage. Here is your mini-nuke. It's a very handy power to unlock as it buffs your pet for a beefy single strike against your foe which only costs mana, without eating any of your life. Use in conjunction with Summon Frenzy skill and apply liberally to foe for best results. Just spam this sucker. It's not like you're running out of mana anytime soon, right? SO there you have it. Necromancer in a nutshell. If I were you I'd use Wizard Enhancements since Necro gets its power mainly from INT and slightly from WIS like Magi do. Right now the Skeletal Mintion pet that you summon to stand before you, shield you and attack your enemies is the ONLY Battle Pet in AQW. We plan on adding several more in coming weeks which will be REAL pets (not temp pets) and nearly all of which are planned to be member only. In addition to the Necromancer Class to be found at the top of the Tower of Necromancy and the AC version in Zorbak's Hut, we have also spent all week working on the devilishly constructed Tower of Necromancy. The original plan for the tower was set down on paper by Artix and it goes from pretty simple to nearly impossible in only 10 floors! If you are able to make it to the top, not only will you get a bonus cutscene where you meet the Master of the Tower but you will ALSO gain access to the MEMBER ONLY Necromancer Shop in which you will find a treasure trove of necrotic weapons and a few alternate armors for the necromancer. 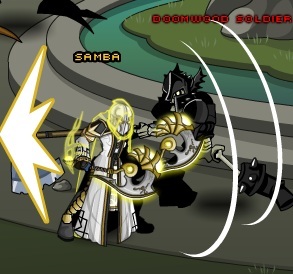 Quibble is also getting a buff this week, vastly increasing the number of items he is offering. This round will be more Pali themed and less skull-i-fied but there are a few putrid additions all provided by AE artist Mennace. Several members of the Artix Entertainment STAFF including Artix, Nythera, Jemini, Korin, myself and several others are headed to the Imperial Swan Hotel Lakeland, FL on Friday, June 10th for PariahCon 2011! It's Lakeland's first ever anime/gaming/collectible convention. Because this is the first year for this con, we expect it to be small but small cons are GREAT for getting to meet lots of new people! Our Artix Entertainment Panel will be held on Friday, June 10th at 4:00 PM EST in the Main Events Room on the 7th Floor. We will be talking about all kinds of secret AE projects, playing round after round of the AQW Battleon Battle Card game with everyone there and just goofing off. We really hope to see you there! Glad to have you back in the lab. Thanks to everyone who wished her well onver Twitter and on the forums.